This week, while doing some much needed clearing the decks in my study, I discovered a long-lost letter from my teenage daughter (now grown-up and with a family of her own) which brought back a memory which made me smile. Their Christmas Eve routine was at stake! 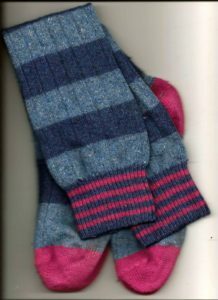 Every Christmas Eve I got out two different pairs of striped knee-high socks I kept for the occasion and each child chose a sock and pinned it with a safety pin to the end of their respective beds. Later that evening, I filled the matching socks; a clementine and some chocolate coins went in first and then an assortment of small gifts I’d collected throughout the year. Later that night, I crept into their bedrooms and replaced each empty sock with the matching full one. As anyone with two children close together in age will know, fairness is everything. The presents themselves weren’t the same (apart from the clementines and chocolate coins) but it was crucial that each child had the same number of items. When I came downstairs the following morning (I allowed myself breakfast in bed at Christmas), I found this letter on the kitchen table. I would like to thank you very much for such a wonderful array of stocking presents. Although my brother woke up late so we couldn’t commence the stocking emptying ceremony until 11 o’clock, we had a great time. I particularly like the cat tin with paper clips (how on earth did you know? That’s just what I needed!) I can’t wait to get stuck into the Gothic Horror. P.S. I still believe in you, even though I am an existentialist. The letter is reproduced with my daughter’s permission. I love the mixture of formal thanks with the appropriate register e.g. 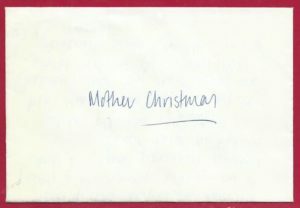 ‘commence’ instead of ‘start’ and her telling me things that I, her mother, obviously knew, but ‘Mother Christmas’ didn’t, like the fact that she and her brother always opened their stockings together – it was clearly very annoying that every time she peeped into his room, he was still asleep. Existentialism is a philosophical theory which emphasizes the individual as a free and responsible agent, able to decide for themselves what to do. Obviously, the very existence of Mother Christmas and the necessity of not opening your Christmas stockings until the morning, not to mention waiting for your brother to wake up, is entirely contradictory to its tenets. I was amused that my daughter felt the need to offer some explanation. The routine exactly the same in my family, but with a choice of red or green walking socks. I think they were well into their twenties before Mother Christmas called it a day. Excellent letter! Thank you, Jan. I’m glad I’m not alone! There were other customs which continued well past their sell by date – which I shan’t mention out of respect for my children’s street cred. We always used to do stockings for everyone in the house. If it’s difficult doing a stocking for your adult children, imagine how tricky stockings for elderly parents can be. We always waited until everyone was ready, before a mass opening. Loads of fun but a bit of a nightmare shopping for them. We only stopped in 2017 when my son was 37! Great letter. Thank you for your comment, Gilli. These Christmas customs are obviously much easier to start than to stop! I hope someone filled a nice stocking for you, too!